PAUL BISHOP ~ WRITER: E-SHORTS: 21 STEPS! The hardest part of committing a murder is getting away with it, especially when the case is assigned to a detective who is a relentless pursuer, a half-Cajun, half-Sioux investigator at the top of his game. The body of an elderly woman is discovered stuffed into her closet in her uptown mansion. Initial investigating officers find no leads, no suspects. 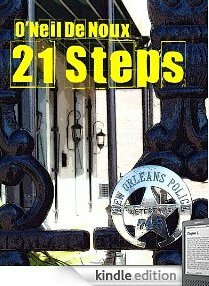 NOPD Homicide Detective John Raven Beau focuses all of his senses, takes the necessary steps to determine time of death, cause of death, manner of death and most importantly, who killed her. The pursuit is methodical and calculated by a man who is a natural hunter, a man born and raised on a swamp, a man whose ancestors’ war cry echoes in his mind. Beau does not need to put on war paint to become a plain warrior. Woe-be-tide the killer. John Raven Beau is on the trial. If you enjoyed this story and would like to read more adventures of Detective John Raven Beau, you’ll want to read the new novel JOHN RAVEN BEAU and the short story collection NEW ORLEANS NOCTURNAL.